Home Beauty Do I Really Need To Cleanse, Tone & Moisturise? Do I Really Need To Cleanse, Tone & Moisturise? Do I really need to cleanse, tone and moisturise? That may well have been a question you have asked yourself. Well a few years ago I’d have said “Nah, a wet wipe and a quick slick of moisturiser does the job”! I used to think the whole Cleanse, Tone, Moisturise thing was a marketing ploy by skincare companies to get us to buy more products when there were cheaper, quicker alternatives easily available. How WRONG was I?! I have PCOS (Polycystic Ovary Syndrome) and amongst other things, skin breakouts/spots is probably the symptom that affects me the worst along with weight gain. Despite at the time being in my late 20’s, I was still getting horrendous skin breakouts on my face and neck which made me embarrassed and added an enormous amount of time to my makeup routine to try and cover them. I felt mortified at the thought of being seen without makeup. During this time my skincare regime consisted of a wash with water in the shower in the morning, and a wet wipe or specially created make-up remover wipe to take my makeup off at the end of the day. Then I would apply moisturiser. I never seemed to have a day without at least 3 pretty major spots somewhere on my face or neck. It was only once I studied Beauty Therapy that I learnt the real reason that we should Cleanse, Tone & Moisturise. Now before I go any further, I’m going to say to all those out there thinking “Lovely idea, but when do I get the time to do this?”, I would like to add that my morning/nighttime skincare regime takes me 4 minutes, I’ve timed it! I’ve detailed my routine and products further down the page. Ideally I confess that I’d prefer to spend longer each day pampering my skin, but reality is by the time I’ve finish with work, the kids and housework etc, I’m just too damned tired and a concerted effort is better than no effort! This is the step that most people (and that previously included me!) miss out in the Cleanse, Tone, Moisturise routine and yet toner is as key as moisturiser. Toners have a number of purposes, however, it is alway best to opt for an alcohol-free toner as these can just be that bit too harsh. I mentioned earlier that your skin is naturally slightly acidic, and after cleansing, toner helps to readjust the skin’s pH to ensure that it stays slightly acidic. We’re not talking acid that burns, but just a very mild pH balanced toner that ensures the skin retains it’s protective properties. Toners also help for remove any residue of makeup or impurities that remain after cleansing and can help to close and tighten pores which can be left open after cleansing. Again you can find a whole range of toners created to be appropriate for your skin type, I choose the No7 Soft & Soothed Gentle Toner as again it’s perfect for my skin type and sensitivities. We all know why we need to moisturise don’t we? As we get older (and by older I very sadly mean the ageing process from teens onwards, not just people of a “certain age”) our skin loses it’s natural moisturising properties and the appearance of our skin changes. It begins to lose it’s plump, even surface appearance, skin tone can change and the texture and elasticity of our skin alters. I see this perfectly when I look at my children. I get told (when I wear makeup!) that I look very young for my age, but in reality, I can see how my skin has aged when I look at my children’s faces, in particular the skin around their eyes and their perfect dewy cheeks! It makes me feel very old! Our skin takes an enormous battering. Whether it be the drying nature of air conditioning, central heating or just the weather, add age related changes and we need to give it a helping hand at keeping us looking and feeling younger. There are so many so called miracle creams on the market, some are hundreds of pounds, some under £30. I recommend asking for samples and trying what you feel works for you. I did this myself a number of years ago and settled very quickly on my favourite! It was mentioned on BBC 2’s Horizon programme and caused quite literal stampedes at Boots stores, I am of course referring to No7 Protect & Perfect. I feel a need at this point to assure that whilst all the products that I have mentioned that I use are No7, I am not employed by Boots to sing the praises of their products. It is just my honest opinion, based on trial, error and sensitivities. 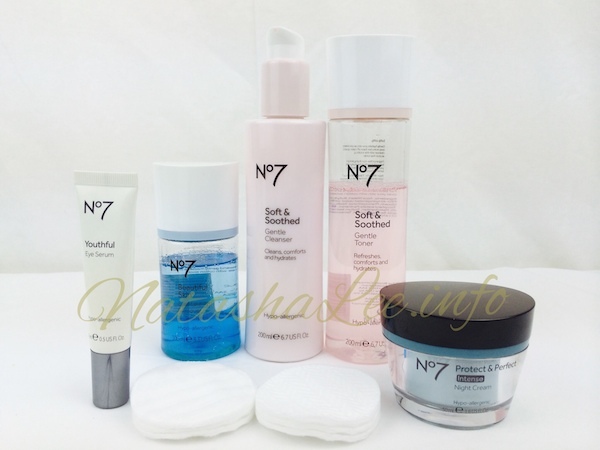 I may find a new favourite Cleanse, Tone & Moisturise product range in the future, but right now, unless I was sent something pretty special, I am perfectly happy with my No7 Protect & Perfect Range. For maximum effect I opt for an eye serum which I apply morning and night, and a Facecream, one containing SPF for daytime and a more intensive cream at night. Cleanse, Tone & Moisturise in 4 minutes! It’s sad that I timed how long my routine took, but my husband used to moan that I took forever applying nightly lotions and potions. I ferociously disputed this and found that evidence was the only way to stop his sarcy comments 😉 so here is my Cleanse, Tone & Moisturise routine in under 5 minutes! 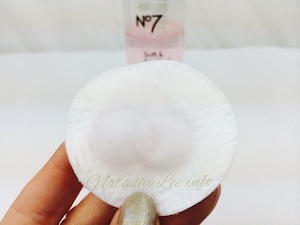 Apply No7 Beautiful Skin Eye Make Remover to a clean cotton pad and remove all traces of eye make up (this is a super easy product to use and I have never had an eye stinging or soreness using it). Apply 3/4 pumps of No7 Soft & Soothed Gentle Cleanser to a clean cotton pad and smooth over face to remove all traces of make-up, dirt and impurities. Turn over the cotton pad and use the other side to cleanse the neck and under the jawline. 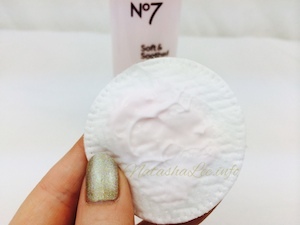 Dampen a clean cotton pad with No7 Soft & Soothed Gentle Toner and smooth all over the face and neck. Apply eye serum to the under eye area using your ring finger to quickly but gently pat and smooth, you want to protect those delicate tissues under the eyes by not scrubbing at them! 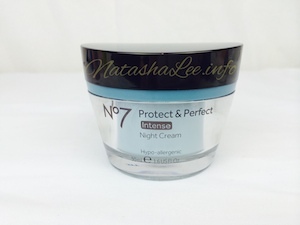 I normally (although I have run out at the moment and have definitely noticed the difference) would use No7 Protect & Perfect Intense Eye Cream. Any residue left on my finger I apply to my lips as they can be one of the first areas to show our age too! 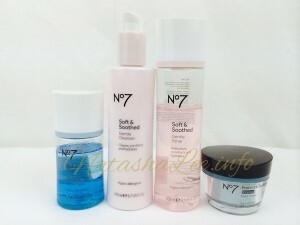 Next quickly apply a No7 Protect and Perfect Intense face serum followed by a No7 Protect & Perfect Intense Day Cream with SPF over the face and neck. I use a scream for mornings and nights. You are left with 50 seconds to apply cuticle oil and moisturise your hands, lower arms & elbows and you are Cleansed, Toned, Moisturised and pampered in under 5 minutes! I swear by this routine. Ok, it could be better, but the reality is, if I have a choice of a 5 minute routine and an extra 10 minutes in bed, or a 15 minute routine…..with a sleep resistant 2 year old I’m going to take the extra 10 mins in bed! My skin is clearer than it has ever been, and my makeup lasts beautifully during the day as my skin is well cared for. Most importantly, I look (most of the time!) younger than my 34 years which can only be a good thing!